The Tuggeranong Vikings are Canberra’s most successful rugby club over the last twenty years, fielding six (6) senior teams in the ACT John I Dent Cup competitions as well as being home to the hugely successful VRugby Academy for men, women, boys and girls and a thriving junior club with numerous development programs. Vikings are the current ACT club champions and reigning Premier 1st Grade, Colts and Women’s Champions. Vikings Rugby continually strives for excellence on the field and prides itself on providing a strong culture of social inclusiveness off the field. At the core of the club are it’s volunteers and support staff. Head or Assistant Team Coaches: For numerous grades from Premier 2nd Grade and Premier Colts Grade to Lower grades and Youth Under 18s. Head or Assistant Team Managers: For numerous grades from Premier 2nd Grade and Premier Colts Grade to Lower grades and Youth Under 18s. Sports Trainers/Strappers: To assist across all of the clubs teams. General Volunteers: To assist with training & game day logistics across all of the clubs teams. Some positions may be remunerated depending on qualifications and experience and all positions will be supported by training and development opportunities (courses), in house education and supply of necessary apparel and equipment. 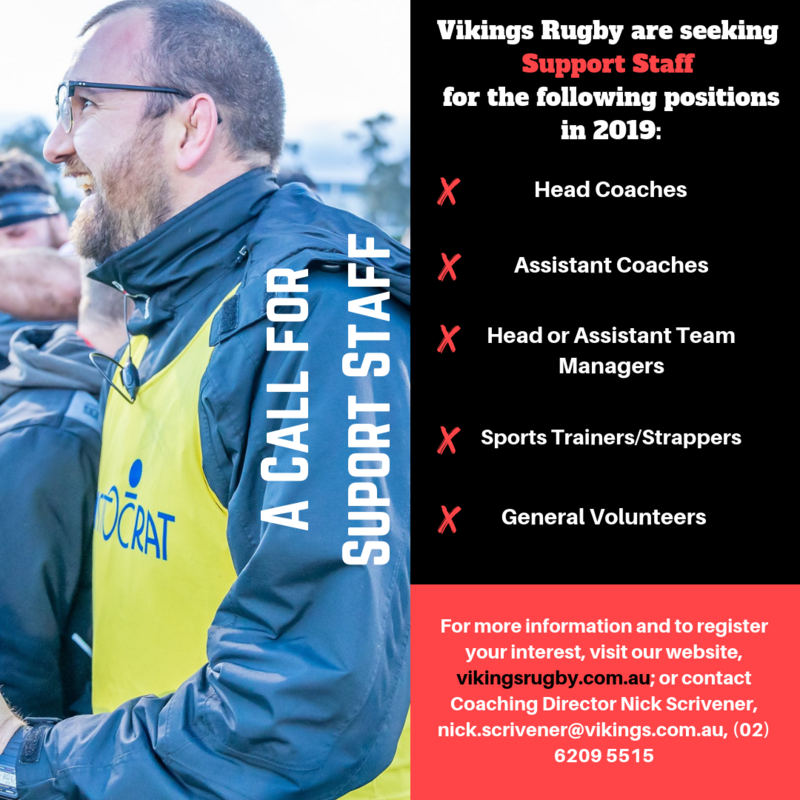 If you are interested in joining a family club with a positive culture who strive for excellence please send an email outlining your interest and experience (or any questions) to the Clubs Coaching Director, Nick Scrivener on nick.scrivener@vikings.com.au or call during business hours on (02) 6209 5515. Expressions of interest should be received by no later than Friday 2 November 2018.